Undercuts: in plastic injection molding industrial, it refers to part features that prevent straight ejection at the parting line, which cause much mold complexity and lead to higher mold construction and maintenance costs. Whenever it's possible, redesign the part to avoid undercuts. Minor part design changes can often eliminate undercuts in the mold. For example, adding through holes can give access to the underside of features that would otherwise be undercuts, simple modifications enable the mold to form a hole in the sidewall rather than with a side-action mechanism. See below figure. Undercut features that cannot be avoided through redesign require mechanisms in the mold to facilitate ejection. These types of mechanisms include side-action slides, lifter rails, jiggler pins, collapsible cores and unscrewing mechanisms. Sliders use cam pins or hydraulic cylinders to retract portions of the mold prior to ejection. Cam-pin-driven slides retract as the mold opens. As the mold closes, the cam pins return the slides to their original position for the next injection cycle. Slides driven by hydraulic or pneumatic cylinders can activate at any time during the injection molding cycle, an advantage in applications requiring the slides to actuate prior to mold opening or closing. Undercuts can also often be released by spring-loaded lifters or lifter attached to the ejector system. These lifters move with the part on an angle during injection mold opening or ejection until the lifter clears the undercut in the part. Unscrewing are commonly used to produce internal threads. A variety of devices can drive the rotation of the threaded cores, including motors, or hydraulic cylinders; or motor-driven gear and chain mechanisms.The mold design should consider to lubricate the various moving parts of the unscrewing mechanism. 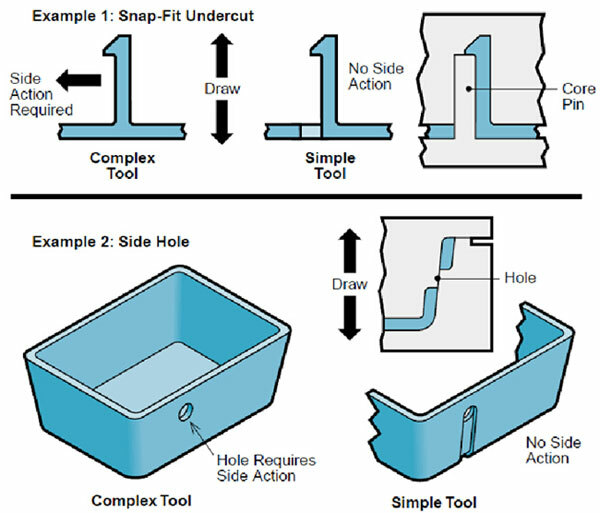 Features such as internal threads, dimples, slots, or grooves on the inside of holes or caps may require collapsible cores. These complex cores are made in segments that collapse toward the center as they retract during mold opening. Available in a variety of standard sizes from various mold-component suppliers, these specialty cores are typically modified to produce the desired undercut shape. The number and complexity of individual core components limit the minimum size of collapsible cores. Slides, cams, collapsible cores, and unscrewing mechanisms are all increase the cost and complexity of the mold, as well as the mold maintenance cost. 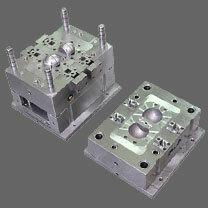 Investigate options that avoid complex mold mechanisms during part design phrase is necessary. Clever part design can often eliminate troublesome undercuts and massively reduce the project budget.